A sunny Lonato hosts 157 drivers from all over the World for the 27th Trofeo "Andrea Margutti", dedicated to the perished driver. 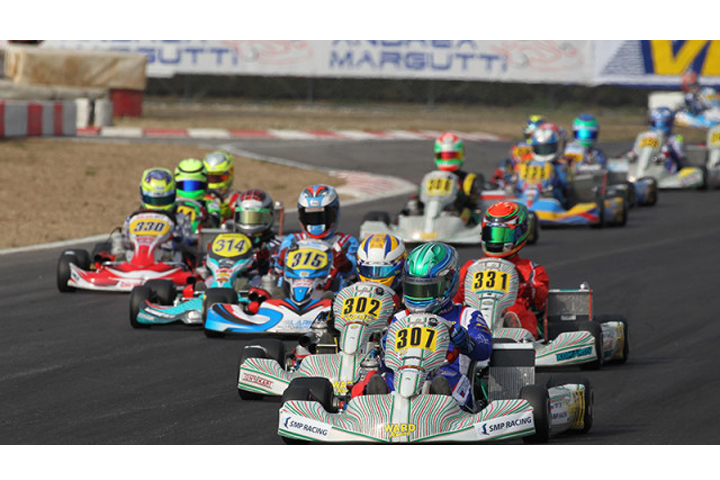 South Garda Karting track and the Trofeo Margutti confirm themselves as a very important test for Italian and foreign drivers, filling the grids during a sunny week-end. Just one exception for OK class, with only eight drivers attending the competition. Giacomo Pollini holds high the Italian flag in the KZ2 in an event which sees Russia's Fomin winning in the 60 Mini, Swedish Shvestov winning within the OK Junior and Smolyar in the OK. The Baby Race duo composed by Alessandro Cenedese (Tony Kart-TM-Vega) and Rusian Fomin (Tony Kart-TM-Vega) leads the week-end since its beginning, and the Russian driver takes the pole position in the prefinal winning the three qualification manches. Second place for Cenedese with Evann Mallett (CRG-TM-Vega) starting third. Fomis wins the prefinal race in front of Mallett and Federico Cecchi (CRG-TM-Vega), starting from 19th place. Alessandro Cenedese finishes his race in 15th position due to a penalty. At the beginning of the final race, Fomin losts some position being forced to a great come back from the 6th position. The Russians wins ahead of Mallett and Kiril Smail (Energy-Parilla-Vega), who started tenth. The team Baby Race starts well also in the OK Junior, with its ensign Noah Watt (Tony Kart-Vortex-Vega) who conquers the leadership during the qualyfing outperforming Ivan Shvestov (Tony Kart-Vortex-Vega) and Alessandro Giardelli (Tony Kart-Lke-Vega). Anyway is the Ward Racing driver Ivan Shvestov who gains the pole position for the prefinal race, winning the qualyfication heats. Beside him in the first row there is Noah Watt, followed by another Ward Racing driver Hampus Ericsson (Tony Kart-Vortex-Vega). The race finishes with the first two position unchanged, and with Bogdan Fetisov (Tony Kart-TM-Vega) third. The great week-end for Ward Racing concludes with a one-two in the final race, with Shvestov ahead of Pavel Bulantsev (Tony Kart-Vortex-Vega), protaginist of a come back which allows him to conlude in front of Fetisov. Qualyfing shows the talent of Alexander Smolyar (Tony Kart-Vortex-Vega) who concludes in front of Emil Dose (Kosmic-Vortex-Vega), with a gap of six tousandth of second, and Simon Ohlin (Tony Kart-Vortex-Vega). The trio remains unchanged until the prefinal starting grid, when Mads Damlund (Tony Kart-Parilla-Vega) outperforms Ohlin gaining the lowest step of the podium. The final race is just another day in the office for Smoylar who passes under the checkered flag ahead of Dose and Ohlin. Between the fourtynine drivers starting in the gear class, Douglas Lundberg (Mach1-TM-Vega) takes the lead in the qualyfing, being faster than Giacomo Pollini (CRG-TM-Vega) of twentyone tousandth of second. During the qualyfication heats, Alexander Schmitz (Tony Kart-Vortex-Vega) finds some serious speed winning two heats and gaining the pole position in the prefinal race. Behind the KSM Schumacher Racing Team driver's shoulders start Giacomo Pollini and Tommaso Mosca (Maranello-TM-Vega). The prefinal race finishes with the first two position unchanged, with Alberto Cavalieri (Maranello-Modena Engines-Vega) third. In the final race Pollini is able to hold high the Italian flag, getting the better of Schmitz in a very tight race. Third place for Cavalieri.